A recent photo montage on Tianya, called Smiles of the Past 50 Years. You won't be able to link to it without registering at Tianya, so I'll post some more below the jump. 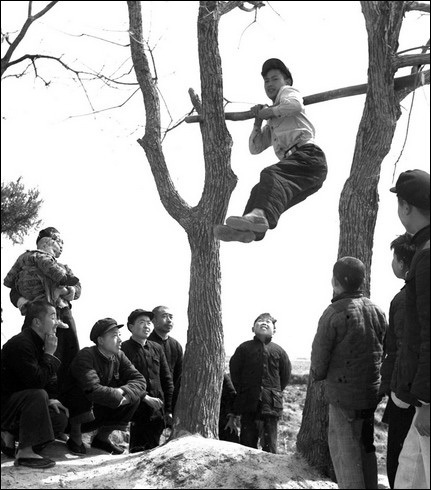 Early spring1957, Hubei province, Macheng County, Xujia Village, 549 Production Brigade: soldier Yang Zhiyi shows off on the bar. 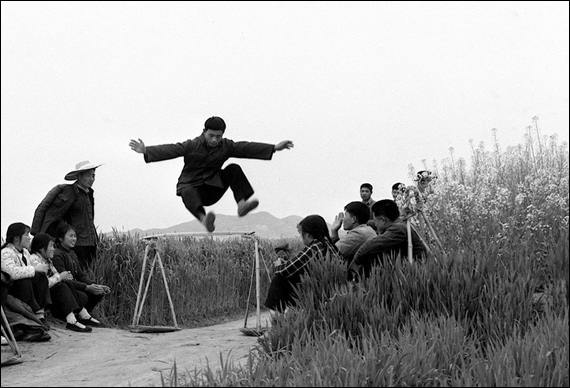 Spring 1975, Hubei Province, Macheng County, Zhongyi Commune, Wangjiyi Production Brigade: practicing high jumping. 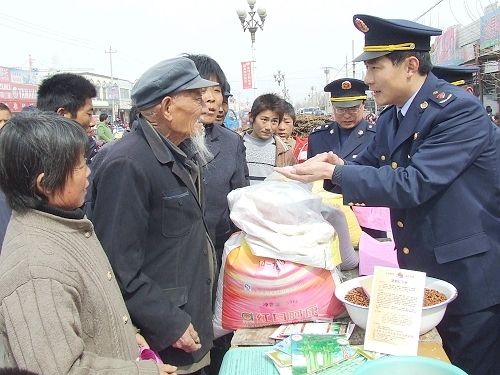 Tuesday morning update from sources in Lhasa. Things are quietening down significantly. Many streets are now open again and cars and taxis are out and about...even in the old quarter. There is still a very heavy military presence but restaurants, teashops and even the Summit cafe with the good coffee is open. A major clean up operation is underway. There is a surprising number of people on the streets including many Chinese tourists who have surfaced from the west end and are going down to the old quarter so see what all the fuss was about. 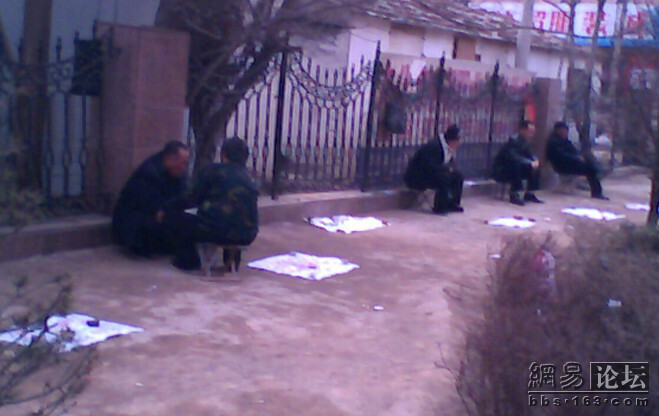 All foreigners have not been kicked out of Lhasa...these reports are false. There seems to be a number of tourists still in town although a very small number. CityIN's press release arrived in my box this morning, and it looks pretty interesting. It's a Hong Kong-developed social networking service that can work on your mobile, and it uses QR codes, which always seem so smart to me but which have not taken off much of anywhere outside of Japan. The Wikipedia entry says: QR Codes storing addresses and URLs may appear in magazines, on signs, buses, business cards or just about any object that a user might need information about. A user having a camera phone equipped with the correct reader software can scan the image of the QR Code causing the phone's browser to launch and redirect to the programmed URL. It would be a very interesting development to have them start to actually be used in China--a form of meaning that could be left in public places but not immediately visible to the ordinary passerby. CityIn's press release cites a different use for QR codes, however, as kind of an easy way to get information from one screen (say in an Internet cafe) to your phone screen. Why is this QR code feature important? Think about where many Chinese youngsters go online - Internet café. Do they have pen/paper/mobile-PC usb? So what if they need to note down the address of the party they are going tonight? If you're looking for a place to find people to do translation jobs for you, either from English to Chinese, or Chinese to English (or possibly any other languages), one place to check out is 1x1y.com, or 翻心翻译. On the jobs board you can find people and companies who post their prices, number of words per day, and email addresses. To get to some of the data you have to register. And of course, the site is in Chinese, so if you're not a Chinese speaker you will have to use Google or something else to help you translate. But even so, it should lead you to people who can help you. Netease's "news" forum has this item today, on a group of rather shabby streetwide fortune tellers: On those who know the fate of others. Hey, they're making a living. Fate can be told, but it all depends on who's doing the telling. Really good fortune-tellers don't sit on the street. When someone dies his or her relatives can't stand the feeling of being separated. Even if one knows it's fake, still sometimes they do make pretty accurate predictions. There's a willingness to spend the money. Whose fault is it, anyway, that China's psychology profession is so backwards? Apologies for those of you who've been bumped off the RSS feed or accessing strange 404 errors, but we're in the middle of transitioning off of the Typepad platform (not very accessible in China) onto our own servers. I'm currently hosting the blog myself (it currently forwards to virtualchina.hongkonggong.com), but I'm hoping to throw it on an IFTF server as soon as they'll set it up for me.